You'll probably have to spend a fair amount of time watering pumpkins in the summertime because they get so large and require quite a bit of water. They are generally thirsty plants by nature. Like most other plants, pumpkins get their food from the soil. They absorb these nutrients by absorbing water. Pumpkins require more water than many other vegetable plants because of their sheer size. Think about it, a grown man weighing 250 pounds requires more food than a small girl weighing 40 pounds. 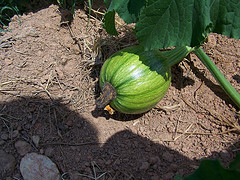 Pumpkin plants are producing fruit that is heavy. This fruit production requires lots of food. Additionally, pumpkins themselves have a very high water content. This water has to come from somewhere during dry periods - namely, YOU! When watering pumpkins, soil consistency is an important consideration. If you live in an area with denser soil, you will have to water less often. However, if your soil is more sandy in nature, you'll need to water more. Use your fingers and dig about an inch into the soil next to your pumpkin plant. Be careful not to disturb the roots. If the soil is dry, it's time to water. 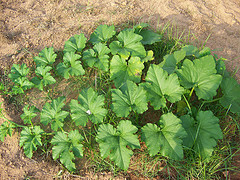 When watering pumpkin plants, focus your efforts at the base of the plant and go slow to avoid eroding away the soil. Try to avoid watering the tops of the plants as this may cause diseases to develop. It's generally a good idea to water in the early morning hours. That way, the afternoon sun will evaporate any water that may have accumulated on the foliage. A soaker hose or drip irrigation system both work well, but a simple watering can or jug will do nicely, too. We've already established that pumpkin plants are heavy feeders. You'll probably benefit by feeding your pumpkin patch a couple of times throughout the season. Before planting, you can always mix in some compost or well-rotted manure with the soil when creating the mounds. After the plant is established, you can help it with a dose of fertilizer every month or so, after the flowers appear. The fertilizer you use should be low in nitrogen and high in phosphate and potassium. 5-15-15 or 8-24-24 fertilizer ratios work best. 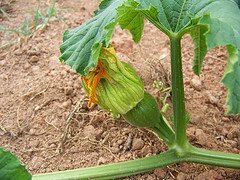 If you use a fertilizer with too much nitrogen, your pumpkin plants will become very large but won't produce much fruit. If you use a granular type fertilizer to feed pumpkins, pay attention to the 3 number code on the bag of fertilizer. These three numbers indicate the amount of nitrogen, phosphate and potassium that are contained in that particular fertilizer, respectively. For instance, a 10-10-10 fertilizer contains 10% nitrogen, 10% phosphate and 10% potassium. A 5-10-10 bag would contain 5% percent nitrogen. A 10-5-10 bag would contain 10% nitrogen, 5% phosphate and 10% potassium. When using granular fertilizer, apply it according to the manufacturer's instructions - usually at a rate of 1 1/2 pounds per 100 square feet. Scatter the granules on the ground around the plant and water them in well. Be careful that the granules don't come in contact with the plant itself, as it may burn or have other adverse effects. You may choose to use a water soluble type of fertilizer rather than a granular type. This works well too. There are many fertilizers made especially for use on pumpkins. They should be available at your local garden center. However, they can be fairly expensive and you'll probably have just as much success with a good, all-purpose fertilizer with a lower nitrogen content. In our own garden, we mix a balanced granular fertilizer into the soil before we plant. We water it in well and till one last time before making our mounds and planting the seeds. After that, we switch to a water-soluble fertilizer that has about twice as much phosphate and potassium as nitrogen. When feeding and watering pumpkins, or anytime you are walking in your pumpkin patch, be very careful where you walk. There are tiny roots that run all along each vine. These roots spread out an inch or two under the soil. Do your best to avoid stepping on these delicate root systems. Some people put down boards to walk on. This also prevents compacting the soil under foot. If you don't want to go to this effort, at least follow the same path every time you walk in your pumpkin patch. Now that you're done fertilizing and watering pumpkins, you can sit back and watch them grow. As the pumpkins start to develop deep, mature colors, it's time to think about harvesting them.